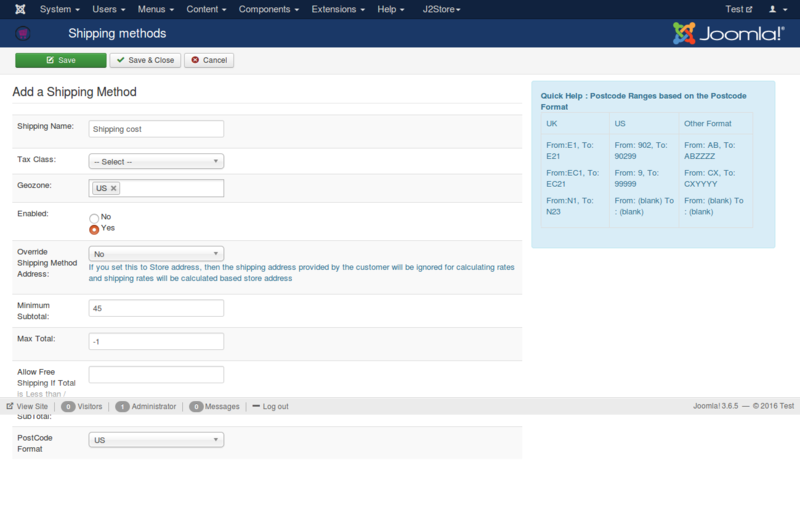 The plugin integrates a postal code based shipping method for J2Store. It will calculate the shipping cost based on the postal code range, weight range and quantity range. You can use all three or just one of them. Download Postal code shipping plugin from our site and install it using standard Joomla installer. Once installed, go to J2Store > Setup > Shipping method and enable Postal code based shipping plugin. 3. After enabling this plugin, open the plugin and configure the basic settings and create a shipping method. Open the plugin and click NEW to create new shipping method. Enter a name for this shipping method. This is what your customers will see at the checkout. The value selected will be used in calculating tax rates for this shipping method. Choose geozones for which this shipping method is available. Choose at least one. The value selected yes will enable the shipping plugin while displaying in the checkout. If you set this to Store address, then the shipping address provided by the customer will be ignored for calculating rates and shipping rates will be calculated based on store address. If you enter a value here, then this method will apply only if the order subtotal is greater than or equal to the value. The shipping method will apply only if the order subtotal is less than or equal to the value entered here. Quite a few commonwealth countries including UK, follow a different post code system. If you are not sure about post code, do not select any format here. To Set Rates click on the link "set rates" of the postcode Shipping method. Enter the starting range of the zip code. For example, 90001. Enter the ending range of the zip code. For example, 90005. Starting weight range. Leave it empty or enter 0 if you dont want to use weight range. Ending range. Leave it empty or enter 0 if you are not using weight range. Starting quantity range (Based on total quantities in the order). Leave it empty or enter 0 if you dont want to use Quantity range. Ending Range. Leave it empty or enter 0 if you dont want to use the Quantity range. Enter your shipping cost here. It is bit tricky. Leave this as 1 if you do not understand. The cost entered per item can be 1. If the cost is for 2 items (2 nos ) , you can enter 2 here. The cost will be divided by two. Suppose your postcodes are made up of 6 alphanumeric characters, and you want to charge $1.00 for shipping to postcodes beginning with AB, $2.00 for postcodes beginning with CX, and $4.00 for all other postcodes. No weight or qty ranges are used. Note: You could also enter AB0000 and CX0000 for the "From" postcodes. You can also use import / export feature to add shipping rates easily. Click Export to download the sample csv file and see how the csv file must be. The below three columns are the mandatory for the csv file. j2store_shipping_postcode_rate_id - Leave this column empty. Rate ID will be updated automatically. shipping_postcode_method_id - It is nothing but Shipping method ID. You must enter shipping method ID otherwise the rates will not be imported correctly into the corresponding shipping method and errors will be trigerred. shipping_postcode_from and shipping_postcode_to - Enter the postcode range between which the shipping charge should apply. Then, enter the weigh trange, quantity range, price range and shipping cost as your wish and import the csv file. For example, the above image has the shipping method named "Shipping cost". Already this shipping method has one rate with postal range 90001 to 90005. Set this to NO in Live websites. You can contact support@j2store.org if you have any questions.